This unique resource describes and evaluates ten of the most important events in British history between 1689 and the present. A full chapter is devoted to each event. Every chapter includes an introduction presenting factual information in a clear, concise, chronological order, and a longer interpretive essay exploring both the short term and far reaching ramifications of the event. The ten events covered are:^L ^DBL The Industrial Revolution^L ^DBL The Seven Years' War^L ^DBL The Napoleonic Wars^L ^DBL Pax Britannica^L ^DBL The Reform Act of 1832^L ^DBL The Crystal Palace Exhibition^L ^DBL The Movement for Irish Independence and Woman Suffrage^L ^DBL World War I^L ^DBL World War II^L ^DBL The Thatcher Era^L Coverage for each event also includes an annotated bibliography of works suitable for students and a full-page illustration. 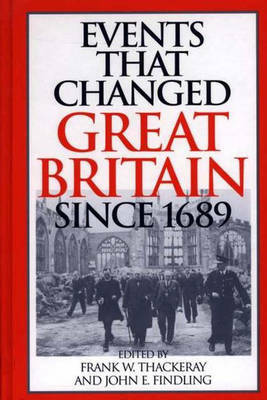 A glossary of terms, a timeline of British history since 1689, a chronological list of ruling houses and monarchs, and a chronological list of prime ministers help students to better understand the major developments in modern British history, along with their significance and long-term impact.